Realm of Chaos – Nurgle’s Children 2018 #13: Malifaux Killjoy (Metal Version) as Herald of Nurgle | Azazel's Bitz Box. 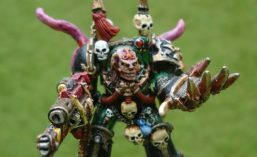 This entry was posted in 40k, Age of Sigmar, Fantasy Gaming, Nurgle's Legions, Realm of Chaos and tagged 40k, Age of Sigmar, Malifaux Killjoy, Nurgle Daemons, Realm of Chaos, Warhammer 40k. Bookmark the permalink. He reminds me of a dungeon boss in Wow, Patchwerk I think his name was. 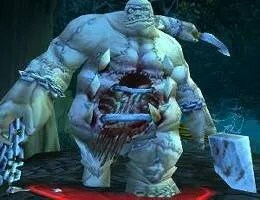 Actually… given the timeframe, and this guy’s meathook on a chain and cleaver weapon combo, it’s not unlikely that he was *cough* “inspired” by WoW’s Flesh Golems. Good spot! Ah the good ol’ days of WoW! Sometimes I miss it, most of the time I don’t. Yeah, it was a good game, but the time required… too much else to do now. That and it became pretty repetitive. I agree though, I have far too many other things to do now to miss it. But once in a blue moon, I think about those days of fun and cursing nightly. Very cool – the perfect champion for Papa Nurgle! Thanks Alex. It’s a pretty cool model, and nice to have it fit so well with an existing force. Thanks IRO. It’s a very nice sculpt so was a pleasure to paint. Excellent skin tones, wound coloration and overall feel of pestilence. The transitions between colours on the skin is well executed. The only suggestion I have is to make the eyes a bit brighter. At the moment the OSL does not look convincing to me, but it could be as simple as adding a very light highlight to the eyes. Thanks! I guess the thing to remember is that the photographs show the model blown up to *much* bigger than actual size. Killjoy’s beady little eyes are actually smaller than those on most 28mm models as he’s a bit of a pinhead. I’ll take a look anyway, but we’re talking really tiny. Eeeeyuuk!!! Scary looking crew! Well done with the hideous! Are those 25mm bases? Nope – Killjoy and the Golem are on 40mm bases, and the Plaguebearer is on a 32mm base, so they’re decent sized models. Well, I’ve never painted a Nurgle, and you all make it look so deceptively easy. It’s making me look forward to GW’s next Nurgle Blood Bowl team, just so I can give it a try. I’m sure mine won’t look half as cool, but worth a go. Also looking forward to your next big Nurgle group shot. There has to be a lot of minis in there now! Are you getting close to finishing out your Nurgle army? This guy started off a dull, pale khaki green colour, but having fun by first highlighting it via a careful drybrush, then adding in some Bugman’s Glow to his gut, moobs, elbows and shoulders, then just diping in and out with thin washes of brown, super-thinned-to-a-wash purple paint and so forth. You can really have a lot of fun experimenting with the Nurgley stuff, so they’re good models to learn and practice on – and you can then take those techniques to other models that aren’t as “loose” with their colours as the Nurgle stuff. Not that much has been added to the Nurgle force since the last group shot really. Just a few individual models like these golems and Sammy the Snail. I should have assembled the metals last month for the challenge!